Little friends™ Timothy Adult Rabbit Food is a unique product formulated to help your pet live a long and healthy life. Little friends™ Timothy Adult Rabbit Food has less calories, lower calcium and more fibre than our Original rabbit food. It is intended for adult, less active, overweight and senior rabbits. For younger and active rabbits we recommend little friends™ Original Rabbit Food. 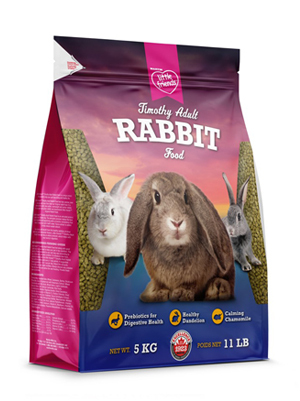 Little friends™ Timothy Adult Rabbit Food is an extruded product made from Timothy Hay. The extrusion process makes the food more digestible and appetizing with a crunchy consistency that helps to keep your pet’s teeth clean. Yucca extract is added to help reduce waste odours. 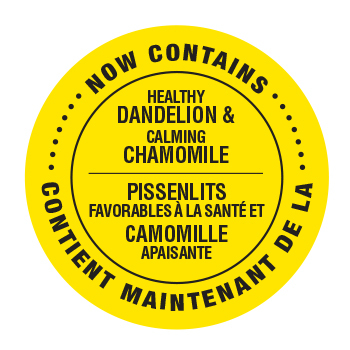 Your bunny will benefit from the healthy addition of dried dandelions and chamomile flowers. Little friends™ Timothy Adult Rabbit Food also has an added prebiotic which helps with your bunny’s digestion. Little friends™ Timothy Adult Rabbit Food fed along with good quality hay is all you need to keep your pet in top condition. The quantity of food consumed by your pet may vary according to age, activity level, size and condition. To introduce new food, gradually increase and mix little friends™ Timothy Adult Rabbit Food with the existing diet over a 7-day period. A suggested feeding guideline is ½ to 1 cup per day. Adjust the amounts to maintain your pet's best condition. Always discard any uneaten food and clean the dish before the next feeding. Provide fresh water at all times. Timothy Meal, Soybean Hulls, Wheat, Soybeans, Barley, Dicalcium Phosphate, Soya Oil (preserved with Rosemary Extract, Mixed Tocopherols and Citric Acid), Wheat Germ, Lignin Sulfonate, Brewers Yeast, Salt, Calcium Carbonate, Rice Hulls, DL-Methionine, Mannan OligoSaccharide, Dried Dandelion, Ascorbic Acid (a source of Vitamin C), Choline Chloride, Dried Chamomile Flowers, Iron Sulphate, Yucca Schidigera Extract, Vitamin E, Zinc Oxide, Manganese Sulfate, Niacinamide, Mineral Oil, Copper Sulphate, Folic Acid, Calcium Pantothenate, Vitamin B12, Vitamin A, Biotin, Selenium, Vitamin K, Riboflavin, Vitamin D3, Pyridoxine Hydrochloride, Thiamine Mononitrate, Calcium Iodate, Cobalt Sulphate.